Mick Clohisey and Ciara Durkan were the winners at today’s Eir Grid Dunboyne 4-Mile, held in gorgeous spring conditions. Upfront, Clohisey pushed the pace from the start and came home a comfortable winner in 18 mins 46 secs. Doing his best to stick with him was Brian Maher of Kilkenny who finished just nine seconds adrift. Winning the battle for third place was Donore’s Eric Keogh. For Ciara Durkan, victory came in her first “proper” race after 15 months of injury and illness. Durkan, a Dunboyne regular, who won the race in 2010 and was third in both 2013 and 2014, came home fifteen seconds ahead of the evergreen Catherina McKiernan in 22 mins 6 secs. Next up for her is the 5000m on the track over the summer followed by a return to cross-country. This was another race where the women outnumbered the men, with 14 women’s teams and 12 men’s. Donore were the women’s winners, with Raheny best of the men and host club Dunboyne second in both. AT THE MALLOW 10-Mile, Michael Harty of East Cork and Leevale’s Michele Finn were the winners. 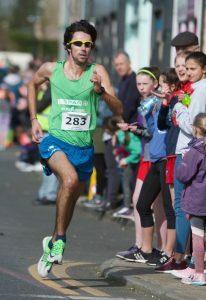 IN ENNIS, Sean Hehir of Rathfarnham won the Eamonn Moloney Memorial 10km in a time of 30 mins 12 secs. 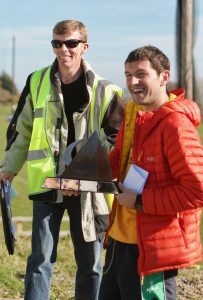 NEWCASTLE’S Ian Bailey was the winner of the Maurice Mullins 52km Ultra held on the Wicklow Way from Glencullen to Ballinastoe and back yesterday. His time was 4 hrs 10 mins 44 secs; second was Barry Hartnett of Mooreabbey Milers in 4:19.30 while third was previous winner Paul Tierney in 4:24.27. First woman was Jackie Toal of BARF in Belfast in 5:13.12; second was Mayo-based Karina Jonina in 5:34.32 and third was Eilis Connery of Rathfarnham in 5:38.41. Rathfarnham’s David Power was first home in the 26km trail race after finishing third in 2013 and 2015. ROB CROSS won his first BHAA race ever at a well-supported K-Club 10km in Straffan, Co Kildare. Laura Shaughnessy ran an impressive time of 34 mins 28 secs. A day later, Cross finished first M40 in Dunboyne. A EUROPEAN junior qualification mark for Davicia Patterson of Bechmount Harriers in the W18 400m was just one of the highlights at the Irish Life Health Irish Juvenile Indoors held in Athlone over the weekend. Patterson won the race in 55.54 secs; second was KCH’s Ciara Deely in 55.96 secs – just off the mark. In two closely-fought long jump competitions, there was only a centimetre in it. Sophie Meredith of St Mary’s jumped 5.61m to win the W17 title; Anna McAuley of City of Lisburn jumped 5.60m. Equally nail-biting was the M19 event with Daniel Ryan of Moycarkey jumping 6.75m and James Vance from Greystones and District 6.74m. There was a W18 jumps double for Sommer Lecky of Finn Valley – 1.75m in the high jump and 5.49m in the long jump. Winning the M18 shot (5kg) was James Kelly of Finn Valley with 16.70m. On the track, James Maguire of DSD showed a welcome return to form when he won the M18 1500m in 4:03.83, beating Mullingar’s Jack Moran who finished in 4:08.62 and Sean Corry of Omagh Harriers who ran 4:09.52. Winning the M18 400m in 49.56 secs was Jack Mitchell of St LOT. In the 60m, Janine Boyle of Finn Valley was the W19 winner in 7.62 secs. Gowran’s David Murphy won the M18 60m in 6.94 secs, while Jack Dempsey of GCH was the M19 winner in 6.95 secs. Men (296): 1 Mick Clohisey (Raheny) 18.46, 2 Brian Maher (KCH) 18.55, 3 Eric Keogh (Donore) 19.24, 4 Thomas Hayes (KCH) 19.27, 5 Conor Duffy (Glaslough) 19.35 . M40: 1 Rob Cross (Crusaders) 20.33, 2 Ciaran McCarthy (Raheny) 21.26, 3 Rory O’Sullivan (Raheny) 21.45. M45: 1 Arnaud Benjacar 9Liffey Valley) 21.54, 2 Peter Gaffney 22.48, 3 Ray Cunningham (Bros Pearse) 23.36. M50: 1 Phelim Glynn (Dunboyne) 21.22, 2 Damien Martin (Raheny) 21.55, 3 Derek Hunter (Dunshaughlin) 22.49. M55: 1 Sean Ryan (Civil Service) 24.12, 2 Gerard Wods (Tallaght) 25.14, 3 Patrick Payne (Na Fianna) 25.37. M60: 1 James Cottle (Crusaders) 24.52, 2 John McHugh (Rathfarnham) 26.04, 3 Vincent O’Neill (Civil Service) 26.21. M65: 1 Patsy Fitzsimons (Sth O’Hanlon) 27.44, 2 Matt Cooley 33.51, 3 David Brady(Raheny) 34.31. M70: 1 Paddy Beauchamp) 31.34, 2 Tom Turner (Civil Service) 34.17, 3 Michael Hegarty (Sth O’Hanlon) 41.06. Wheelchair: Cillian Dunne (Borrisokane, MJ) 19.45. Teams (12) – 1 Raheny Shamrock 38, 2 Dunboyne 89, 3 Civil Service 99. Women (336): 1 Ciara Durkan (Skerries) 22.06 , 2 Catherina McKiernan (Cornafean, W45) 22.21, 3 Kate O’Neill (MSB) 23.03, 4 Isabel Carron (Skerries) 23.34, 5 Karen Costello (Dunleer,W40) 23.47, 6 Annette Kealy (Raheny, W45) 23.52. W40: 2 Zoe Quinn (Dublin Bay RC) 24.40, 3 Emma Cooper (Clonliffe) 25.03. W45: 2 Emilia Dan (Dunboyne) 24.49. W50: 1 Adrienne Atkins (Raheny) 26.41, 2 Mary Watters (Navan AC) 28.03, 3 Olwyn Dunne (Crusasers) 28.48. W55: Lauren Flood (Dunboyne) 30.56, 2 Linda Gunning (Bohermeen 31.24, 3 Bernie Blake 32.52. W60: 1 Nuala Reilly (Drogheda and Dist) 28.12, 2 Mags McCreary (Civil Service) 29.51, 3 Frances Gordan 31.51. W65: 1 Eileen O’Brien (Lucan Hrs) 32.02, 2 Josie Power (Fingallians) 33.34, 3 Rose Healy 39.28. Wheelchair: 1 Shauna Bouquet (Craughwell) 21.30, 2 Fiona McCormack (W45) 22.40. Teams (14) – 1 Donore Harriers 44, 2 Dunboyne AC 50, 3 Raheny Shamrock 115. Corporate team (mixed) 1 EirGrid RC864, 2 Maemofi 1343, 3 Chemistry Comets 1729. Men: 1 Michael Harty (East Cork). 53.00, 2 Alan O’Shea (Bantry) 53.05, 3 John Meade (St Finbarr’s) 55.03, 4 Alan O’Brien (Eagle) 55.07, 5 Cathal O’Connell (St Finbarr’s, M50) 56.33, 6 Chris Murphy (Leevale) 56.46. M40: 1 Michael Harrington (Bantry) 57.40, 2 Gary Egan (An Bu) 58.00, 3 Tom O’Brien (Riocht) 59.37. M45: 1 Johnny O’Sullivan (Galtee Runners) 61.00, 2 John Murphy (Grange Fermoy) 62.20, 3 Dermot Kearns (Dooneen ) 63.57. M50: 2 Tom Blackburn (Mooreabbey Milers) 61.04, 3 Ronan Boland (Eagle) 61.30. M55: 1 Kevin Boag (Mallow) 69.10, 2 Denis Carroll (Eagle) 69.42, 3 Michael Pratt (Grange Fermoy) 73.35. M60: 1 Willie Hayes (St Finbarr’s) 71.06, 2 Seamus O’Suilleabhain 73.35, 3 Oliver Kearney (Duhallow) 78.07. M65: 1 Maurice Tobin (Grange Fermoy) 74.40, 2 Jerry Twohig (Duhallow) 79.15, 3 Dens Sheehan 94.03. M75: 1 John O’Leary (Leevale) 90.40, 2 Tony Dunne (Grange Fermoy) 93.35. Women (405): 1 Michelle Finn (Leevale) 57.51, 2 Aoife Cooke (Youghal) 59.40, 3 Deirdre Grady (Ennis Track) 64.19, 4 Adele Walsh St Senan’s, W40) 64.39, 5 Sinead Kevany (W40) 64.53, 6 Una Murphy Plant (Kinsale TC, W45) 66.39. W40: 3 Annemarie Power (Eagle) 70.19 W45: 2 Helen Sheehan (Dromohane Road Runners) 67.58, 3 Clotilde Fitzgibbon (Grange Fermoy) 73.57.W50: 1 Mary Buckley (Donoughmore) 80.08, 2 Kathleen Browne 83.05, 3 Catherine Clancy (St Catherine’s) 84.06. W55: Mary Sweeney (St Finbarr’s) 71.25, 2 Mary Mulcahy (StFinbarr’s) 87.03, 3 Catherine Linehan (Watergrasshill) 91.08. W60: 1 Carmel Mac Domhnaill (West Limerick ) 93.40, 2 Marie O’Reilly 99.11, 3 Elizabeth Mills (Bandon FFL) 1:58.24. M70: Maggie Dunne (Grange Fermoy) 1:55.21. Men: 1 Declan Power (M40) 33.10, 2 Donal Foley 34.46, 2 Brian Purcell 34.40. Women: 1 Anne Marie Kenny (W40) 41.48, 2 Caitriona Cosgrave 42.28, 3 Rebecca Carolan (W40) 44.07. Men: 1 Pablo Quintana 16.00, 2 Conor Halpin 16.20, 3 Ross McCann 16.29. Women: 1 Emma Flynn 19.21, 2 Luda Bulich 21.30, 3 Patricia Forde 22.26. Men: 1 Rob Cross (Arcdox, M40) 32.41, 2 Clive Quinn (M35) 32.50, 3 Rossa Hurley (M35) 32.55, Eoin Callaghan (Teachers) 33.12, 5 David Scanlon 33.31, 6 Kevin Donagher 33.34. M45: John Canning 34.06. M50: Eddie Newman (The Run Hub) 35.15. M55: Tom Cuddy (Dublin City Council) 38.08. M60: Nollaig McEntegart 39.44. M65: Barry Potts (Army) 41.15. M70: Bobby King 47.31. Women (134 entries): 1 Laura Shaughnessy (Temple St Hospital) 34.28, 2 Meghan Ryan 35.26, 3 Charlotte Kearney (W35) 37.34, 4 Niamh Devlin (HSE) 38.21, 4 Michelle Cox 38.29, 6 Eimear Fitzmaurice 38.51. W50: Annemarie Kenny (Dublin Fire Brigade) 39.56. W45: Vanessa Sallier (Mercer) 42.22.W50: Orla Gormley (Aer Lingus) 41.49. W55: Linda Finnegan (Irish Life) 44.00. W60: Nuala Reilly (Fair Gate Health) 44.59. W65: Eileen O’Brien (St John of God) 50.38. W70: Evelyn McNelis (Teachers) 51.08. Jun: Emily Ryan (TCD) 45.56.